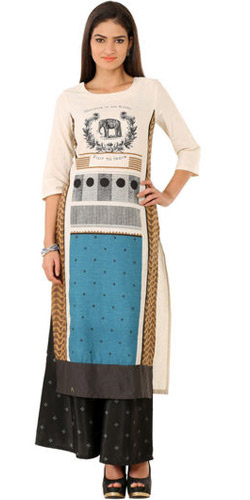 Impress your dear one by sending this Mod Design W Kurti and brighten up her mood instantly. This regal Kurti designed by W is a top-class attire and can be worn on a regular basis. The Kurti is made of cotton-blend fabric and encompasses a round neck, long side-slits and enticing prints on the front panel.